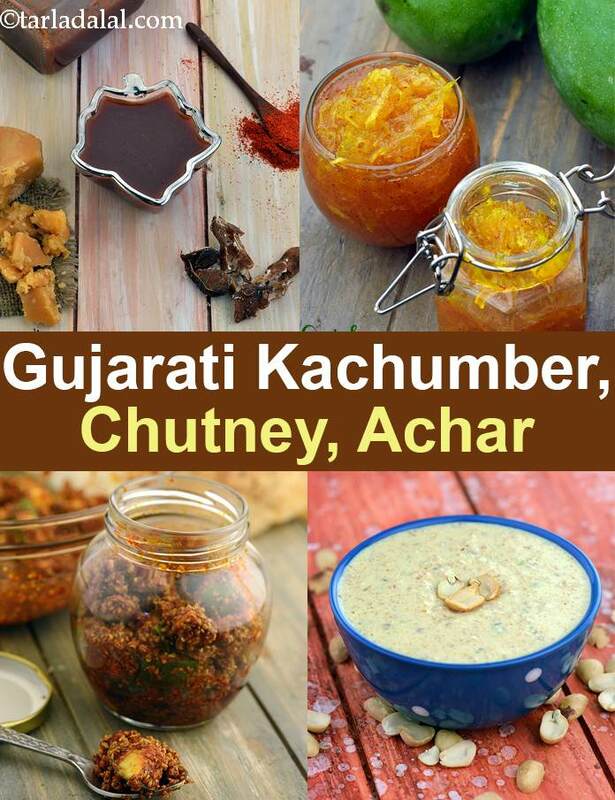 Gujarati Kachumber Recipes, Gujarati Chutneys and Achar Recipes. Accompaniments perk up a meal with their tangy flavours and peppy textures. Chutneys and pickles like Instant Golkeri and Gajar Marcha nu Sambhaariyu can be made 2-3 days in advance in small batches and enjoyed instantly with any meal or snack, while kachumber like Cabbage Kachumber is refreshing, salad-like dishes prepared just before a meal. Find the perfect accompaniment to your meal in this section. Gujarati favorite fafda is often accompanied with delectable Fafda chutney, chatakedaar Roasted green chillies in a spicy masala, tongue- tickling Gujarati Raw Papaya Chutney and sweet Jalebi. This is an ideal breakfast at most Gujarati households on Sunday. Salads are referred to as ‘Kachumber’ in Gujarati. Kobi and Gajar Kachumber is a popular accompaniment served at weddings. Come summers and Gujarati’s start making varieties of achaar. Grated, cubed, chopped raw mangoes are mixed with sugar and spices and sun-dried. Chundo is an authentic Gujarati pickle made by mixing raw mangoes and dried under sun till all the sugar dissolves, you can add chili powder to perk up the taste. If you want to make Chunda offseason then try this Quick Mango Chunda. Methia Keri is another delightful preparation made by mixing sundried mango cubes with a freshly mixed masala, it is spicy and zesty enough to jazz up your meals. The word ‘gol’ literally means jiggery and ‘keri’ is mango. Golkeri is a traditional Gujarati sweet and spicy pickle. Gujarati food is highly influenced by native, seasonal vegetables like green garlic that is found in abundance during Winter. It is not only used in authentic subzi like oondhiya but also, you can make this Green Garlic Spread with strong flavours. It tastes best when eaten with hot bajra rotla or jowar/ragi roti. Another such wonderful ingredient is the mogri or green radish pods. Toss some chopped mogri with a traditional tempering and relish Masala Mogri with your meal. You can even make a lip-smacking Purple Mogri Raita spiced with regular masalas. Gujaratis celebrate Navratri with great enthusiasm. They not only play garba/dandiya for nine days but some of them also observe fast. So, serve amazing deep-fried delights like sabudana vada, kand aloo pakoda and faraali pattice with Peanut Curd Chutney. The usage of raw mango is not limited to pickles, you can even make a tongue-tickling Kacchi Keri Ni Chutney Also, chaats and snacks are incomplete without Khajur Imli ni Chutney, Garlic Chutney. Try our Gujarati Kachumber Recipes, Gujarati Chutneys and Achar Recipes and other Gujarati Recipe articles below. Bhavnagri marcha are spicy but not very very spicy. Each chillies are cut into small roundels and blend well with black salt to give nice tangy taste.